Kettlebell training has gained massive popularity in recent years and for good reason. The kettlebell is an extremely versatile piece of training equipment, and can be used to reduce body fat and build muscle mass. Amanda Perkins who works with Kettlebell Kings as a senior writer has written and developed a fantastic and informative series focused on different kettlebell workouts. This includes taching points on how to perform each exercise successfully and safely and links to helpful video examples. In this first workout part, Amanda has combined both high-repetition cardiovascular workouts and muscle building training into one amazing workout. The first portion of the workout uses double kettlebells supersets to focus on building strength and increasing muscle mass. The second portion of the workout is a metabolic conditioning workout using a single kettlebell that will increase endurance and post-exercise caloric burn. A superset consists of two exercises performed back to back with no rest in between. They are great for building strength and stamina efficiently, as you can complete more work in less time. These supersets are performed using two kettlebells of equal weight. Perform 10 reps per exercise in each superset. Rest 60 seconds between supersets. Complete three rounds. 1. Clean the kettlebells into the rack position. The wrists should be straight and the elbows tucked into the body. 2. Squat down, sending the hips back while maintaining a neutral spine. The elbows should come off the body to balance the weight in the squat position. Lower down until thighs are parallel with the floor or slightly lower. 3. Push into your heels to engage the posterior chain of the legs and return to the upright position. 2. Bend through the knees slightly, then quickly extend the legs and push the kettlebells overhead, straightening your arms fully. The momentum from the legs should transfer to the arms to help bring the kettlebells overhead. 3. Lower the kettlebells back to rack position with control. 1. Lie on your back and bring the kettlebells into position: arms bent, elbows into your sides, and weight of the kettlebells over your elbows. Ensure the hands are fully inserted through the bell handles and wrists are straight. 2. Press the kettlebells straight up over your chest, extending your arms fully. 3. 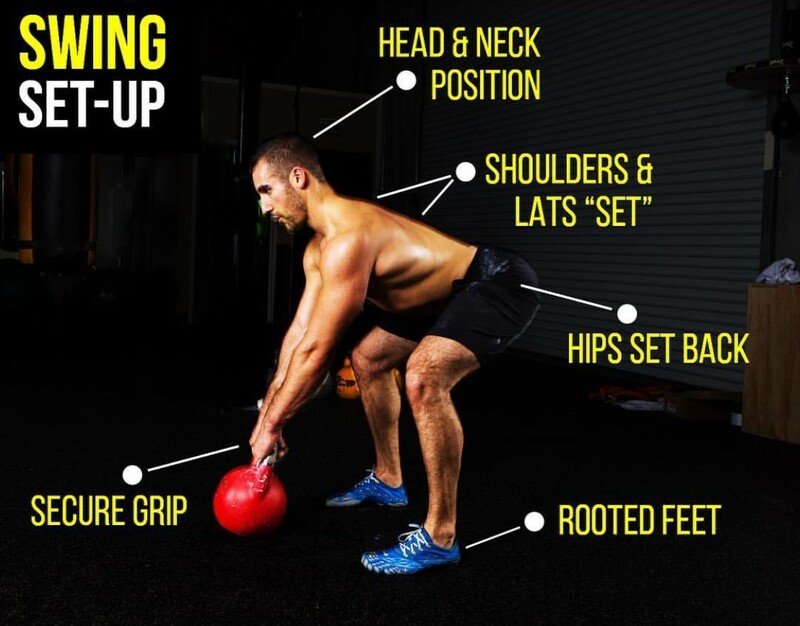 Lower the kettlebells back to starting position. 1. Hold a kettlebell in each hand with your arms straight by your sides. Feet are about hip width apart or slightly narrower. 2. Bend forward at the waist, lowering the kettlebells toward the floor, keeping your arms straight and with a slight bend in the knees. Keep the spine neutral. 3. Keep the shoulders depressed as you pull your elbows up and back toward your belly button. The initiation of the movement should come from retracting your shoulder blades. Ensure your neck stays in neutral position and you are not moving anything except your arms. 4. Lower the kettlebells back to the floor, releasing the shoulder blades at the bottom before the next repetition. 1. Stand holding a kettlebell in each hand with your arms straight by your sides. 2. Step your right foot forward, bending through the left leg until the left knee almost touches the floor. Keep your chest upright throughout the step. 3. Push off your right heel and step back together, returning to the start position. 4. Repeat with the left foot forward. 1. Stand upright with your feet slightly narrower than hip width apart, holding a kettlebell in each hand with your arms by your sides. 2. Hinge at the hips and lower the kettlebells down to tap the floor. You should maintain a neutral spine with a very slight bend in the knee throughout the movement. If you cannot reach the floor maintaining neutral spine, bring the floor up by placing boxes underneath the kettlebells on either side of you. 3. Push through the floor and contract the glutes to fully extend the hips and come back to the starting position. A metabolic conditioning workout, otherwise known as a Metcon, is designed to challenge the anaerobic and aerobic systems with the goal of increasing both cardiovascular and muscular endurance. The following exercises are completed using only one kettlebell. Perform each exercise for 20 seconds per side. Complete three rounds as quickly as possible, resting as needed. 1. Stand upright, feet about hip-width apart, with a kettlebell on the floor about two feet in front of your feet. 2. Hinge at the hips with a neutral spine and grab the handle with both hands. Pull the shoulders down and away from the ears to set your lats and upper back. 3. Swing the kettlebell back between your legs, making sure the bell stays above your knees and the shoulders stay at hip level or slightly above. Knees can be slightly bent. 4. Powerfully extend your hips, contracting the glutes and core at the top of the lift. The kettlebell should float up to about shoulder height, with elbows slightly bent. 2. Hinge at the hips with a neutral spine and grab the handle with your right hand. Pull the shoulder down and away from the ears to set your lats and upper back. 4. Powerfully extend your hips, contracting the glutes and core at the top of the lift. As the kettlebell reaches the float point around hip level, pull the bell into rack position, allowing the hand to open and insert fully through the bell handle. 5. Keeping a small arc around the body, drop the kettlebell back between the legs into the swing. Think of giving the kettlebell a slight head start before following it with your torso. 2. Hinge at the hips with a neutral spine and grab the handle with one hand. Pull the shoulder down and away from the ear to set your lats and upper back. The free arm will lightly tap the top of the kettlebell in the starting position, and will mimic the working arm throughout the lift. 4. Powerfully extend your hips, contracting the glutes and core at the top of the lift. At the floating point of the lift (around shoulder level), pull your elbow back and to the side of your body so the kettlebell moves toward you. 5. Guide the kettlebell back down along the same path, allowing the arm straighten. Hinge at the hips once your arm hits your waistband. Completing the workout above on a regular basis will boost to your cardiovascular endurance and muscular strength. For more kettlebell workouts for men, stay tuned for Part 2 of our 10-part series.